Calendar listings are for marine-related events that are either free or don't cost much to attend. Email event listings here. See the complete 2019 racing calendar here. The print calendar is available at select Bay Area distribution points. Mar. 29-May 5 — Tall ships Lady Washington and Hawaiian Chieftain will be in Redwood City through 4/9; Oakland 4/11-23; Eureka 4/26-28; and Coos Bay, OR, 5/1-5/5. Info/tickets, (800) 200-5239 or www.historicalseaport.org. Mar. 30 — Plumbing Workshop with Bill Edinger, Spaulding Marine Center, Sausalito, 10 a.m.-2:30 p.m. $50 includes coffee bar & lunch. Info, www.spauldingcenter.org/events. Mar. 30 — Dockwalker Training, Newport Sea Base, Newport Beach, 10 a.m.-12:45 p.m. Info, www.dbw.parks.ca.gov. Mar. 30- Apr. 27 — Small Boat Sailing, 9:30 a.m., and sailing for veterans and their families, 11 a.m.-4 p.m. every Saturday with BAADS at South Beach Harbor in San Francisco. Free. Info, (415) 281-0212 or www.baads.org. Mar. 31 — Nautical Swap Meet, Berkeley YC. Info, www.berkeleyyc.org. Mar. 31-Apr. 28 — Keelboat Sail, noon-4 p.m., every Sunday with BAADS at South Beach Harbor in San Francisco. Free. Info, (415) 281-0212 or www.baads.org. Apr. 1, 1979 — From Letters in Vol. 23 of Latitude 38: "I just like to drop you a line to tell you how much I enjoy reading your sailing sheet. You might say, hell, are we read that far abroad? Yes you are. Your magazine is sent to me regularly and even though I live in Sydney, Australia, I have many happy memories of sailing on S.F. Bay during my holidays the last couple of years. I hope to do a bit more Bay sailing in the not so distant future, so in the meantime keep this great sailing sheet sailing along." — Balmain, Australia, S-Lat. 33–52'. "If I miss an issue, you're going to be singing soprano." — Long Beach. Apr. 3 — Racing Rules Seminar, Sequoia YC, Redwood City, 6:30-8:30 p.m. With Phil Meredith. Info, www.sequoiayc.org. Apr. 3-24 — Wednesday Yachting Luncheon Series, StFYC, 11:45-1:30 p.m. Lunch and a dynamic speaker each week for about $25. All YCs’ members welcome. Info, www.stfyc.com. Apr. 4 — Salty Dogs and Haute Couture on SF Yachts, Corinthian YC, Tiburon, 7 p.m. With speaker Gina Bardi, reference librarian, San Francisco Maritime National Historical Park Research Center. Free, but RSVP to speakers@cyc.org. Apr. 4, 5 — How to Expand Your Sailing & Cruising Options seminar at Pacific Sail & Boat Show, Craneway Pavilion, Richmond. 4/4: 2:15 p.m.; 4/5: 10:30 a.m. With Pat McIntosh of Cruising Notes and Delta Doo Dah's Christine Weaver. Free with boat show ticket. Info, www.pacificboatshow.com. Apr. 4-7 — Pacific Sail & Power Boat Show, Marina Bay Yacht Harbor & Craneway Pavilion, Richmond. Come see Latitude 38 in booth #C-1. Info, www.pacificboatshow.com. Apr. 5 — Latitude 38 Party at Pacific Sail & Power Boat Show, Assemble Restaurant, Richmond, 6 p.m. Info, www.pacificboatshow.com. Apr. 6 — Berkeley Bay Festival, Shorebird Park, 11 a.m.-4 p.m. Live music, food, costume parade, games, crafts, boat rides. Free. Info, www.cityofberkeley.info/BayFestival. Apr. 6 — Open House, Cal Sailing Club, Berkeley, 1-4 p.m. Free introductory sailboat rides in keelboats and dinghies. Coincides with the Berkeley Bay Festival. Info, www.cal-sailing.org. Apr. 6, May 4 — Chantey Sing aboard Eureka, Hyde Street Pier, San Francisco, 8-10 p.m. Dress warmly and bring a mug for hot cider. Free, but RSVP to Peter, (415) 561-7171. Apr. 10 — International Offshore Safety at Sea Refresher Course, SFYC, 8:30 a.m.-5 p.m. $140. Info, www.sfyc.org. Apr. 10 — Dockwalker volunteer training, Oakland YC, Alameda, 7-8:45 p.m. Info, www.dbw.parks.ca.gov. Apr. 11 — Knot Tying 101, Gig Harbor Boat Shop, WA, 7 p.m. $10-$15. Info, www.gigharborboatshop.org. Apr. 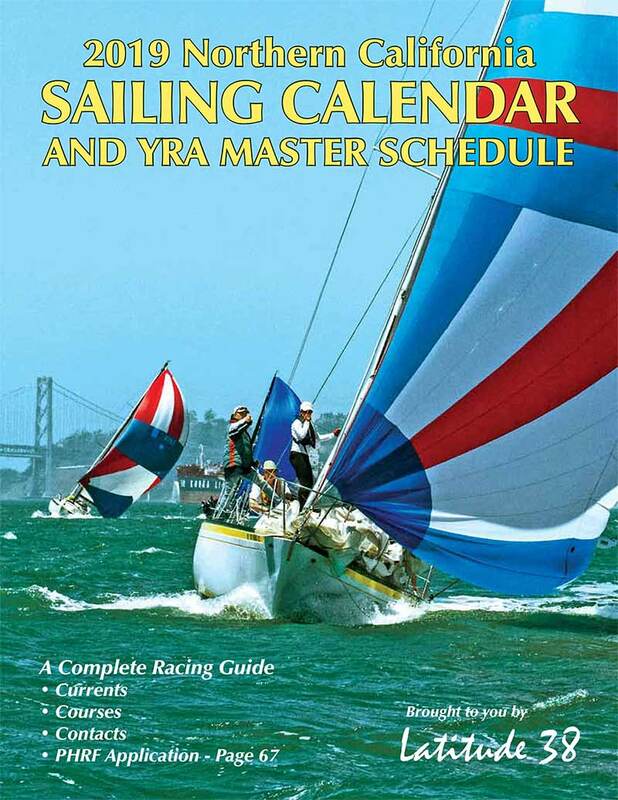 11, May 9 — Single Sailors Association meeting and dinner, Ballena Bay YC, Alameda, 6:30 p.m. Guests welcome. Info, www.singlesailors.org. Apr. 11-12 — International Offshore Safety at Sea with Hands-on Training, SFYC, 8:30 a.m.-6 p.m. $275; no refunds after 3/10. Info, www.sfyc.org. Apr. 12 — 80th Anniversary Celebration, San Francisco Maritime Museum, 6-10 p.m. Big band orchestra, cocktails, hors d'oeuvres; 1936 period costume encouraged. $45. Info, (415) 561-6662 or www.maritime.org. Apr. 13 — The Bay Model Wants You!, Sausalito, 10-11 a.m. Volunteer orientation. Ranger Joanne, (415) 289-3027. Apr. 13 — Opening Day on Half Moon Bay. HMBYC, www.hmbyc.org. Apr. 13 or 14 — International Offshore Safety at Sea Hands-on Training portion, EYC, Alameda, 9 a.m. Moderated by Chuck Hawley. $200. Info, https://2020.pacificcup.org. Apr. 13, 27 — Trekking the Bay Model, Sausalito, 1:30-2:30 p.m. A guided tour. Info, (415) 332-3871. Apr. 14 — Marine Flare Collection Event, East Marina Green Triangle, San Francisco, 9 a.m.-2 p.m. Handheld & aerial flares and smoke signals accepted. Info, (415) 355-3760. Apr. 17 or 18 — Tidal Currents talk & live demo, Bay Model, Sausalito, 7 p.m. Led by Kame Richards. $15. By RSVP only to Jim, (707) 759-2045 or jimtantillo@comcast.net. Apr. 19 — Full moon on a Friday night. Beer can race, anyone? Apr. 20 — Dockwalker volunteer training, Loch Lomond YC, San Rafael, 9-11:45 a.m. Info, www.dbw.parks.ca.gov. Apr. 21 — Easter Sunday. Apr. 22 — Earth Day Monday. Apr. 27 — Dockwalker volunteer training, Silver Gate YC, San Diego, 10 a.m.-12:45 p.m. Info, www.dbw.parks.ca.gov. Apr. 23 — Wildlife and Drones, Bay Model, Sausalito, 7-9 p.m. How We Can Reduce Disturbance While Capturing Images. With Alicia Amerson, American Cetacean Society. $5-$10 donation. Info, (415) 332-3871. Apr. 26 — Viper Winter Clinic, Alamitos Bay YC, Long Beach. Info, www.viper640.org. Apr. 26 — Knot Your Typical Beer Tasting, Gig Harbor Boat Shop, WA, 6-7:30 p.m. Knot-tying and beer sampling, light snacks provided. $35. Info, www.gigharborboatshop.org. Apr. 28 — Opening Day on the Bay. Theme: Holidays on the Bay. Info, www.picya.org. Apr. 29, May 1, 6, 8, 13, 15 — Crew Class, Sequoia YC, Redwood City. Monday evenings in the classroom; Wednesday evenings on the water. With Stan Phillips. $60 includes ASA's Sailing Made Easy. Email stan574@comcast.net with "Sequoia Crew Class" in the subject line. Apr. 30 — Aquatic Invasive Species Workshop, Aeolian YC, Alameda, 8:45 a.m.-2:45 p.m. Free. Register by 4/26. Info, www.dbw.parks.ca.gov. May 1 — Dockwalker volunteer training, Red Cross, San Jose, 7:30-9 p.m. Info, www.dbw.parks.ca.gov. May 4 — Nautical Swap Meet, Owl Harbor, Isleton, 8 a.m.-noon. Free entry & space. Info, (916) 777-6055 or www.owlharbor.com. May 4 — Dockwalker volunteer training, DRYC, Marina del Rey, 10 a.m.-12:45 p.m. Info, www.dbw.parks.ca.gov. May 5 — New speaker series at Bay View Boat Club debuts with Joel Selvin, rock critic for the Chronicle. San Francisco, 1 p.m., following brunch, 11 a.m.-1 p.m. Info, www.bvbc.org. May 7 — Aquatic Invasive Species Workshop, Mott Training Center, Pacific Grove, 8:45 a.m.-2:45 p.m. Free. Register by 5/3. Info, www.dbw.parks.ca.gov. May 9 — Dockwalker volunteer training, Stockton YC, 6-8 p.m. Info, www.dbw.parks.ca.gov. May 11 — Dockwalker volunteer training, Cabrillo Marina, San Pedro, 10 a.m.-12:45 p.m. Info, www.dbw.parks.ca.gov. May 12 — Mother's Day. May 13 — Dockwalker volunteer training, Solano Water Agency, Vacaville, 11:30 a.m.-1:30 p.m. Info, www.dbw.parks.ca.gov. Please send your calendar items by the 10th of the month to calendar@latitude38.com. If you’re totally old-school, mail them to Latitude 38 (Attn: Calendar), 15 Locust Avenue, Mill Valley, CA, 94941, or fax them to us at (415) 383-5816. But please, no phone-ins! Calendar listings are for marine-related events that are either free or don’t cost much to attend. The Calendar is not meant to support commercial enterprises. Mar. 29-31 — Ficker Cup match-racing regatta, a qualifier for the Congressional Cup. LBYC, www.lbyc.org. Mar. 29-31 — IKA Formula Kite Spring Regatta/Pan Am Qualifier in San Diego. SDYC, www.sdyc.org. Mar. 30 — 40th Doublehanded Farallones Race for monohulls & multihulls. BAMA, www.sfbama.org. Mar. 30 — Sadie Hawkins Race. Woman skipper, full crew, on the Estuary. IYC, www.iyc.org. Mar. 30 — America's Schooner Cup, hosted by Silver Gate YC in San Diego. Benefits the Navy-Marine Corps Relief Society. Jerry, (619) 818-7010 or www.americasschoonercup.com. Mar. 30 — Trans-Folsom. FLYC, www.flyc.org. Mar. 30 — Champion of Champions Regatta in Santa Cruz. SCYC, www.scyc.org. Mar. 30-31 — San Francisco Cup. SFYC, www.sfyc.org. Mar. 30-31 — Intercollegiate Regatta. StFYC, www.stfyc.com. Apr. 2-7 — Congressional Cup, a Grade 1 international match-race championship. LBYC, www.lbyc.org. Apr. 3 — J/22 Spring Series. StFYC, www.stfyc.com. Apr. 5-7 — Etchells Midwinters West in San Diego. SDYC, www.sdyc.org. Apr. 6 — Singlehanded/Doublehanded #2 & 3. SeqYC, www.sequoiayc.org. Apr. 6 — YRA Summer Series #1 hosted by BYC. YRA, www.yra.org. Apr. 6 — Doublehanded Lightship. IYC, www.iyc.org. Apr. 6 — Andy Byrd Memorial Race. CPYC, www.cpyc.com. Apr. 6 — Don Wan Regatta. TYC, www.tyc.org. Apr. 6 — North Bay Series #1. VYC, www.vyc.org. Apr. 6, May 11 — Mercury Series on the Estuary. EYC, www.encinal.org. Apr. 6-7 — J/Fest. StFYC, www.stfyc.com. Apr. 6-7 — Wheeler Regatta. BYC, www.berkeleyyc.org. Apr. 6-7 — Opti Harken #2 (youth). SFYC, www.sfyc.org. Apr. 7 — Estuary Cup. EYC, www.encinal.org. Apr. 7 — PHRF Spring Day 2/Lefler Cup. MPYC, www.mpyc.org. Apr. 7, 14, 28, May 5 — Spring Series on the San Joaquin River. SSC, www.stocktonsc.org. Apr. 9-14 — World Sailing Nations Cup match-race final, sailed in J/22s, with 10 Open and 10 Women skippers. StFYC, www.stfyc.com. Apr. 12-14 — One Design Offshore Championship. NHYC, www.nhyc.org. Apr. 13 — Commodore's Regatta. SCYC, www.scyc.org. Apr. 13 — Round the Rocks. SSS, www.sfbaysss.org. Apr. 13 — Interclub #1. IYC, www.jibeset.net. Apr. 13 — Summer #1. SeqYC, www.sequoiayc.org. Apr. 13 — Pelican Races & potluck, SSC, Stockton. Info, www.sfpelicanfleet1.com. Apr. 13 — Commodore's Cup. BVBC, www.bvbc.org. Apr. 13 — Small Boat Race #2. EYC, www.encinal.org. Apr. 13-14 — Resin Regatta. SFYC, www.sfyc.org. Apr. 13-14 — Big Dinghy. RYC, www.richmondyc.org. Apr. 13-14 — NWICSA Rainier Cup collegiate regatta on the Columbia River Gorge, OR. CGRA, www.cgra.org. Apr. 14 — One Design Spring 2. MPYC, www.mpyc.org. Apr. 14, 28, May 12 — Baxter-Judson Series races. Presidio YC, www.presidioyachtclub.org. Apr. 14, May 12 — Coronado 15 Sailing & Racing. HMBYC, www.hmbyc.org. Apr. 15 — Deadline to sign up for the Race to Alaska, which will start from Port Townsend on 6/3. "I dare you," says the invitation to enter. Info, www.r2ak.com. Apr. 20 — Doublehanded Long Distance Race #2. SSC, www.stocktonsc.org. Apr. 20 — Spring One Design #1. SCYC, www.scyc.org. Apr. 20, May 11 — Races #1 & 2 on Scotts Flat Lake. GCYC, www.gcyc.net. Apr. 26-28 — Ultimate 20 PCCs. MPYC, www.mpyc.org. Apr. 27 — OYRA Lightship Race. YRA, www.yra.org. Apr. 27 — Bullship Race. Sausalito to San Francisco in El Toros. RYC, www.richmondyc.org. Apr. 27 — Twin Island. SYC, www.sausalitoyachtclub.org. Apr. 27 — Konocti Cup, 26- or 13-mile race for PHRF, one designs, multihulls, non-spinnaker. KBSC, www.kbsail.org. Apr. 27 — Anniversary Cup/Staff Commodore's Cup. SFYC, www.sfyc.org. Apr. 27 — Intraclub Regatta. StFYC, www.stfyc.com. Apr. 27-28 — Camellia Cup. FLYC, www.flyc.org. Apr. 27-28 — Etchells PCCs. SDYC, www.sdyc.org. Apr. 28 — Spring SCORE #1. SCYC, www.scyc.org. May 3-5 — Yachting Cup. SDYC, www.sdyc.org. May 4 — Classic Boat Invitational Series #1. SYC, www.sausalitoyachtclub.org. May 4 — Commodore's Cup. HMBYC, www.hmbyc.org. May 4 — Homeport Regatta. Pursuit race for cruising boats & liveaboards in Ventura County. Theme: It's Ohana. Vintage Marina, homeportregatta@yahoo.com. May 4 — Point Dume & Return, Berger/Stein Race #3. DRYC, www.dryc.org. May 4-5 — Great Vallejo Race. YRA, www.yra.org. May 4-5 — SailGP stadium racing. Info, www.sailgp.com. May 5 — UC Davis Sailing Team Benefit Regatta on Lake Washington, West Sacramento. LWSC, www.lwsailing.org. May 5 — Singlehanded Race. SSC, www.stocktonsc.org. May 5 — PHRF Spring Day 3. MPYC, www.mpyc.org. May 9-12 — Oregon Offshore, Astoria to Victoria, BC. CYC of Portland, www.oregonoffshore.org. May 11 — OYRA Jr. Waterhouse. YRA, www.yra.org. May 11 — Lady & the Tramp. FLYC, www.flyc.org. May 11 — Santana 22 Team/Match Racing. SCYC, www.scyc.org. May 11-12 — Elvstrom/Zellerbach includes Laser District 24 Championship. StFYC, www.stfyc.com. ALAMEDA COMMUNITY SC — Laser racing every Thursday night, 4/11-5/30. Mike, mjpbishop@gmail.com or www.sailalameda.org. BALLENA BAY YC — Friday Night Grillers: 4/12, 4/26, 5/10, 5/24, 6/7, 7/19, 8/2, 8/16, 8/30, 9/13. Info, www.bbyc.org. BAY VIEW BC — Monday Night Madness, Spring: 4/15, 4/22, 5/13, 5/27, 6/10, 6/24. Info, www.bvbc.org. BENICIA YC — Every Thursday night, 4/4-6/27, 7/11-8/22 & 9/5-9/26. Dan, (707) 319-5706 or www.beniciayachtclub.org. BERKELEY YC — Every Friday night, 4/5-9/27. Info, www.berkeleyyc.org. CAL SAILING CLUB — Year-round Sunday morning dinghy races, intraclub only. Info, www.cal-sailing.org. CLUB AT WESTPOINT — New Friday Fun Series: 4/26, 5/24, 6/7, 7/19, 8/23, 9/20, 10/4. Food & drinks after each race; all are welcome. Info, www.theclubatwestpoint.com. CORINTHIAN YC — Every Friday night, 4/12-8/23. Marcus, racing@cyc.org or www.cyc.org. COYOTE POINT YC — Every Wednesday night, 4/10-10/9. Info, regatta@cpyc.com or www.cpyc.com. ENCINAL YC — Spring Twilight Series, Friday nights: 4/5, 4/19, 5/3, 5/17, 6/7. Info, www.encinal.org. FOLSOM LAKE YC — Beer Can Races, every Wednesday night: 5/1-8/28. Summer Sunset Series, Friday nights: 5/10, 6/14, 7/19, 8/2. Info, www.flyc.org. GOLDEN GATE YC — Friday nights: 5/10, 5/24, 6/7, 6/21, 7/5, 7/19, 8/2, 8/16, 8/30. Charles, raceoffice@ggyc.com or www.ggyc.com. HALF MOON BAY YC — Friday nights: 4/19, 5/3, 5/17, 5/31, 6/14, 6/28, 7/5, 7/12, 7/26, 8/2, 8/23, 9/6, 9/20, 10/4. Info, www.hmbyc.org. ISLAND YC — Spring Island Nights, Fridays: 4/12, 4/26, 5/10, 5/31, 6/14. David, (510) 521-1985, iycracing@yahoo.com or www.iyc.org. KONOCTI BAY SC — OSIRs (Old Salts in Retirement) every Wednesday at noon, year round. Info, www.kbsail.org. LAKE TAHOE WINDJAMMERS YC — Every Wednesday night, 5/15-10/2. Info, www.tahoewindjammers.com. LAKE YOSEMITE SA — Every Thursday night: 5/16-9/26. Info, www.lakeyosemitesailing.org. MONTEREY PENINSULA YC — Every Wednesday night: 4/3-9/25. Info, www.mpyc.org. OAKLAND YC — Sunday Brunch Series: 3/3, 3/17, 3/31. Info, www.oaklandyachtclub.net. RICHMOND YC — Small Boat Midwinters: 3/3. Green Fleet Junior Midwinters: 3/2. Info, www.richmondyc.org. SF MODEL YC — Victoria R/C races Wednesday afternoons, Spreckels Lake, Golden Gate Park. Info, www.sfmyc.org. ST. FRANCIS YC — Wednesday Evening Series for Folkboats, IODs & Knarrs: 4/24-6/26 & 8/7-8/21. Thursday Kite Series: 5/2, 5/16, 5/30, 6/13, 6/27, 7/11, 7/25, 8/8, 9/5, 9/19, 9/26 (reserve). Info, www.stfyc.com. SANTA CRUZ YC — Every Wednesday night through 10/30. Info, www.scyc.org. SAUSALITO YC — Spring Sunset Series, Tuesday nights: 5/7, 5/21, 6/4, 6/18. Info, www.sausalitoyachtclub.org. SEQUOIA YC — Every Wednesday night: 4/17-10/2. Info, (650) 361-9472 or www.sequoiayc.org. SIERRA POINT YC — Every Tuesday night: 5/7-8/27. Info, www.sierrapointyc.org. SOUTH BEACH YC — Friday Night Series: 4/19, 4/26, 5/3, 5/17, 5/24, 5/31, 6/7, 6/21, 6/28, 7/19, 8/2, 8/16, 8/23. Info, www.southbeachyachtclub.org. STOCKTON SC — Every Wednesday Night: 6/5-8/28. Info, (209) 951-5600 or www.stocktonsc.org. TAHOE YC — Laser Series, every Monday night: 5/27-8/26. Sailing Series, every Wednesday night: 5/29-8/28. Info, gm@tahoeyc.com or www.tahoeyc.com. TIBURON YC — Every Friday night: 5/24-9/13. Ian, race@tyc.org or www.tyc.org. VALLEJO YC — Every Wednesday night: 4/3-9/25. Info, www.vyc.org. Apr. 3-7 — La Paz Bay Fest, Sea of Cortez. Club Cruceros de La Paz,www.clubcruceros.net/TheClub/BayFest.html. Apr. 14-20 — Les Voiles de St. Barth. St. Barth YC, www.lesvoilesdesaintbarth.com. Apr. 17-23 — Antigua Classic Yacht Regatta. Antigua YC, www.antiguaclassics.com. Apr. 18-22 — Bequia Easter Regatta, Windward Islands. Bequia Sailing Club, www.bequiaregatta.com. Apr. 26-28 — Newport to Ensenada Race. NOSA, www.nosa.org. Apr. 27 — Conch Republic Cup/Key West Cuba Race Week starts. Info, www.conchrepubliccup.org. Apr. 27-May 3 — Antigua Sailing Week. Antigua Sailing Association, www.sailingweek.com. May 4 — Salty Dawg Spring Cruising Rally. St. Thomas, USVI, to Hampton, VA. Info, www.saltydawgsailing.org. May 7-12 — Tahiti Pearl Regatta. International fleet racing. Info, www.tahitipearlregatta.com. May 8 — Antigua Bermuda Race starts. Royal Bermuda YC, www.antiguabermuda.com. June 21-23 — Tahiti-Moorea Sailing Rendez-vous, with Latitude 38. Info, www.tahiti-moorea-sailing-rdv.com. July 6-16 — Optimist Worlds at Antigua YC, English Harbour. Info, http://2019worlds.optiworld.org. July 10-13 — 50th Transpac race from L.A. to Honolulu starts off Point Fermin. Info, https://2019.transpacyc.com.